“The Shazaam movie. Have you heard of that? (Jimmy Church asks if he's talking about Kazaam, the movie with Shaquille O'Neal) No. There was movie that came out in the '90s. It was starring Sinbad, the comedian, but apparently the movie never really existed. And this has really bothered me because me and my wife and a whole bunch of other people remember this movie but it never actually existed. So, I guess it's maybe more obscure than some of the other Mandela Effects but the interesting story I have about that was I was talking to my neighbor, her name is Mary, in her 70s, she remembers it as well. And she meticulously recorded things and cataloged them and she has a copy of it on cassette but apparently it never existed. (Jimmy asks how she could have a copy of the movie if it never existed) This is where it gets sticky. 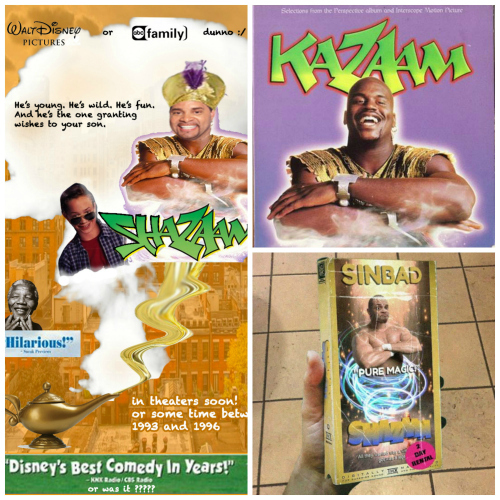 You can read about it here - Did Sinbad Play a Genie in the 1990s Movie 'Shazaam'?